I love bags and glad to find this cute bag for my son, it's NoHoo bag for kids. Yeah the designs are so cute, there are 3 types theme to choose from namely Ocean, Castle and Forest. NoHoo have got 40 designs and innovation awards at home and abroad, awarded by REDDOT (Germany) and IF (Germany). Feel free to see my unboxing video on the NoHoo bag, the package is nice as it comes with the plastic bag that can sealed back the bag after used. Often we wonder where to put the bags after used, this bag has comes with the plastic bag that we can keep the NoHoo bag. 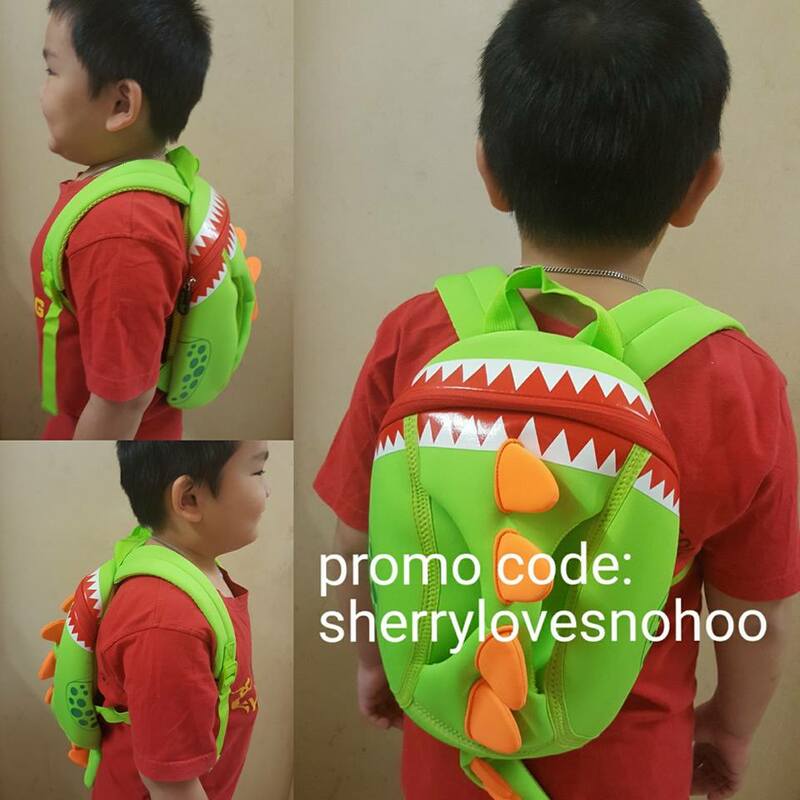 My little one likes green color and dino, so I have chosen for him this dino designed bag code is NH023. Green dino backpack that is so cute and easy to carry, this bag is 30 x 23.5 x 14cm. The material is Neoprene, the bags has 14 days unconditional return with 100% satisfaction guarantee. You can also shop for this cute bags for little ones and it's convenient to shop online with Internet access. Neoprene is a unique material that the first factory to neoprene as the material of children bag in China. Neprene is a synthetic rubber produced by polymerization of chloprene. Durable and environmental friendly and safe for skin. Shop now at nohoo2u.com and the promo code for my readers : sherrylovesnohoo for MYR10 off. Shop now as free shipping for Peninsular Malaysia. Christmas is coming soon, what to shop for little ones and loved ones? So cute designs that I even see mommy wearing them. So many designs to choose from and there's Shark and Dolphin, Monkey, Lion, Tiger, Elephant, Rabbit, Butterfly, currently they have Monkey set and Dino Set available. It consists of one sling bag and a backpack. You can visit the website nohoo2u.com to view them.